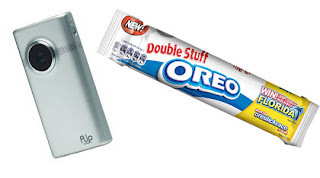 Mummy-Tips: Win a Flip Cam Package courtesy of Oreo! We love Oreo! I also use it to make a fabulous Oreo cheesecake. The double stuff Oreo cookie. It's a) Double Stuff Oreo - yum! Thanks for the giveaway. I've tweeted @feefeegabor. TOTALLY HAVE TO LICK THE MIDDLE. Wooww...yummy Its Double Stuff Oreo. It tastes great. Hope you're having a good holiday!! If I win first thing I'll do is get some chocolate milk and dip those Oreos's in them, best way to eat them! Sorry, not trying to enter twice, but I did forget contact details despite the warning! That would be Double Stuff Oreo. They are AWESOME!